I lived in Bletchley until I was 16, I remember the cattle market and the big annexe as far as I can recall did house a copper car as well as other things. I also remember chicken and small animals being sold from there too. 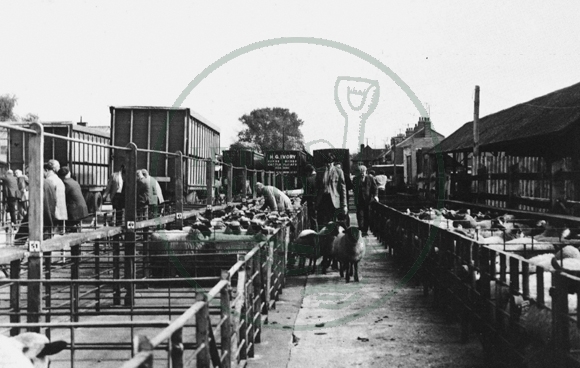 I have lived in Bletchley all my life, 60yrs, and remember visiting the cattle market as a child. It sat where Sainsburys sits now. There was also a large market selling all sorts of things, Cash and Carry had their fabric hanging out of the Windows for people to see. Bletchley was a busy market town. I lived in Bletchley from 1955 til 1962. On market days we would sometimes skip dinner at Wilton and ride our bikes to the chip shop,then we loved to watch the cows getting their ears punched and listen to the auctions.School dinner was a shilling back then,chips were sixpence…so we spent the other sixpence on something from the market stalls….not exactly big spenders but it was always a fun excursion and so hard to force ourselves to ride back to school,we were often late. I lived in Bletchley from 1955 til 1962 age 11 to almost 18.We often played in the closed cattle market vaulting over the bars around the enclosures.We liked to race each other vaulting along the rows of sheep pens …as shown in the photo.There was an empty building with an old upright piano in the corner.One of my pals..Harry..could play a few tunes .Beautiful Dreamer and The Colonel Bogey march were 2 of them. I remember a large barn like structure at the livestock market, occasionally on non livestock days there used to be a general auction. On livestock auction days I also recall the bar in the Park Hotel being open all day. Licensing laws allowed that on market days. Does anybody remember a barn style building next to the cattle market, it may even be the one in the image. I can remember as a boy about 42 years ago seeing a lot of old cars stored inside, they were vintage style. Why were they there, and who did they belong to?